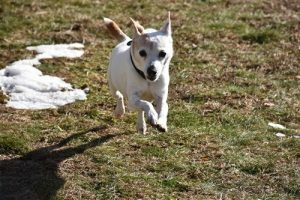 Chloe is a 13-year-old mostly white, with a brown ear patch, female smooth coat Jack Russell who weighs a very delicate 14 pounds. Sadly, Chloe was no longer able to live with the family who had her since a puppy as the baby seems to have developed some allergies and there was very little time to care for the dog. 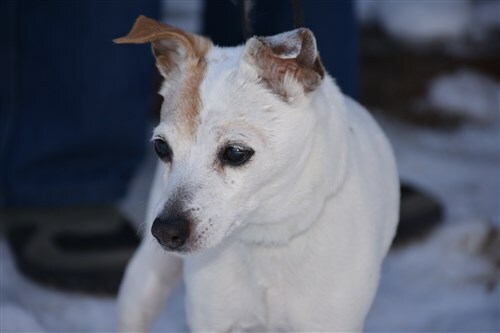 A diminutive little Jack Russell with soft and inquisitive eyes, she is very gentle and tolerant of all people. Chloe has tons of energy, she loves going for walks and seems to prance the whole way. She has some stiffness in her gait, but that will certainly not stop her from enjoying her daily exercise and running around in the yard. 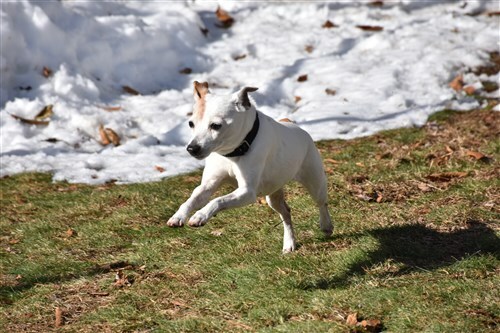 In typical Jack Russell fashion, she does not know the word senior, and is not planning to slow down anytime soon. Chloe is extremely healthy, great bloodwork and had had 17 teeth removed during her dental; now eating like a champ!! Chloe loves her plush toys, snuggling under the blanket in her bed and just being loved and caressed by her human. She is a very calm dog, nothing seems to phase her and she is good with other dogs as well. She does fine in a crate, but she never has the need for one as she rides beautifully in the car and likes to look out the window keeping an eye on things going by. She is fully housetrained but might need to go out a little more often than a much younger dog. She very much enjoys looking out the windows and watching for any critters that happen to be in her vicinity. Seniors make wonderful companions, they allow us to while away the hours with a gentle warmth snuggled up beside us as we read, watch television or keep company with our jacks. They never ask for much in their later years, and still give us lots of enjoyment, long walks, and playtime while only asking for the understanding that we will keep them safe and loved until they cross the bridge.